The Insulated Weighted Bowl keeps food hot or cold and has additional weight added internally to the base. This adapted bowl helps prevent spills and is insulated to keep hot food hot, or cold food cold.The 15.5 oz bowl has weight added to the base of the bowl which helps people with tremors of the hand to prevent spills. 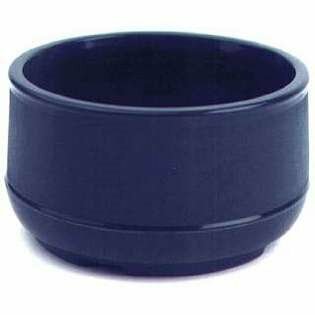 The double wall construction bowl holds up to 12 oz. of hot or cold foods. Optional disposable lids are available for the Insulated Weighted Bowl. Note: Do not microwave the Insulated Weighted Bowl due to steel weight.Insulated Weighted Bowl Features:Added weight helps reduce spills for users with hand tremors.Keeps foods hot or cold.Insulated Weighted Bowl Specifications:Capacity: Can hold up to 12 oz.Weighs: 15.5 oz.Dimensions: 4 ½ inch diameter, 2 ¾ inches high.Color: Blue.Care: Dishwasher safe. Do NOT microwave.